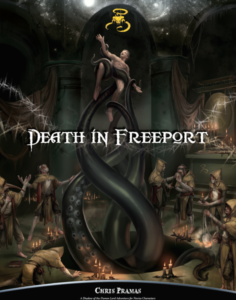 Last time in Death in Freeport, Jevan’s investigation into the disappearance of the scholar Lucius was interrupted by an attack by mercenaries. Once they were defeated, he found a scrap of parchment with an address on it. Q: Does he go there this evening? A: Yes. He figures that if it is their HQ he’ll just stay away. It leads to the Black Gull, an exceedingly seedy looking tavern, filled with a rough crowd. The note writer, Enzo, is easy to spot, being a thin, nervous looking man who’s very out of place. Q: Confront Enzo, or just follow him? A: Yes, but there’s a random event. Move towards a thread (Finding Lucius)/Oppress Information. As Jevan starts to move through the crowd, Enzo decides he’s had enough, gets up and starts the leave the tavern. He doesn’t notice Jevan as he heads towards the door. Having realised that if he actually confronts Enzo he’ll have to do something to stop the kidnappers being warned of his intention to rescue Lucius, Jevan decides to follow him instead, ending up at a bricked up building that Enzo enters. He decides that whilst time may be off the essence, he’d rather return in the morning fully refreshed and better able to deal with the challenges ahead; Jevan returns to his inn and checks out, finding a new place to stay this evening. The night passes uneventfully and in the morning he returns to the bricked up building. Checking the door reveals it to be locked; Jevan doesn’t lock picks, and a boot to the door doesn’t do anything except make a lot of noise. He could go and get a weapon more suited to breaking down a door, but doesn’t want to waste time now that he might have alerted anyone inside. Instead, he decides to try the roof, casting Epiphany to make getting up easier. Fortunately for him the roof is in as bad a state as the rest of the building; he’s able to get through the roof and drop down into the room below without making much more noise or hurting himself. The interior of the building is rubble strewn; looking around Jevan notices that the foundations are made of high quality, well dressed stone, which looks older than the shell of a building that now perches on them. At the back of the building is a trapdoor to the cellar. Seeing nowhere else to go, Jevan pulls open the trap door, then casts Spellbound Weapon and lights his lantern. The stairs lead down to a wine cellar which contains 9 shed-sized oak casks, and no other ways out. Obviously there has to be some other way out of here, and looking around Jevan spots a trail of footsteps through the dust that lead to one cask. Examining it reveals that it’s hollow and hides a secret door. Opening the cellar sets off a warning spell, alerting the villain of the piece. Who’s next actions are to teleport in and alert some of the enemies before retreating to the inner sanctum to await the intruders. The tunnel behind the casks is well constructed and old. It continues a short way forwards, down a couple of steps and turns northwards. Ahead the tunnel opens out into a simple room. Q: Is Jevan checking for traps? Walking down the corridor, Jevan just has time to hear the click when the floor gives way beneath his feet and he’s falling. He lands in a heap at the bottom of a 5 yard deep, smooth walled pit. There’s no way out without assistance or being able to carve handholds. The module says 1d6 damage, but the rulebook says 2d6 for an equivalent trap, so we’ll go with that. We could activate Defy Danger and handwave getting out, but let’s see if the GME provides any solutions first. The serpent people alerted by the main villain are going to discover Jevan in the pit shortly. Q: Do they try to kill him immediately? A: No. One of them slithers off to alert the priest. A further check reveals that the priest orders them to get the intruder out of the pit and bring them to the temple rather than just kill them. Jevan came around with a groan. Looking up he saw… snakes? Yes. Large snakes. And a hooded man looking into the pit. A rope was lowered and Jevan hauled out of the pit by the degenerate serpent people who hiss angrily. One of them makes a grab for his short sword. Q: Does he allow this? The acolyte isn’t fooled, however the GME reveals that he’s prepared to play along. The serpent people grab Jevan and start marching him towards the door to the right. The human marches ahead and enters the room first. The door swings open to reveal an octagonal chamber, painted black. There’s an octagonal pit in the centre of the room, about 3 yards deep. On the far side is a table covered with ritual paraphernalia – candles and a gong. Candles and incense have already been lit, and the acolyte stands beside the gong. As the serpent people push him towards the pit Jevan starts to think he might have made a mistake – his intention had been to be brought directly to whomever is running the show, not to be apparently sacrificed. He starts trying to struggle free, but the serpent people hold fast and continue to drag him forwards. As they do so, the acolyte starts hitting the gong. On the third strike, Jevan is thrown towards the pit at the same time as a mass of black tentacles erupts out of the pit. Everyone in the room has to make a Will roll or take 1d3 sanity damage when this happens. An agility roll with one bane to avoid going in at the last minute is failed. (Unfortunately, casting spells requires the ability to speak and use an implement, so Epiphany can’t help). With a more generous GM, Jevan might have had a Fortune point to spend to guarantee a success, but I checked after the “I’m here to join you” ploy, and the GM wasn’t feeling generous. The tentacles grab Jevan and his mind fills with images of a dark and nameless deity, its malign influence corrupting all it touches. A couple of minutes later the tentacles fade away. The acolyte and the serpent people look down into the pit, hoping to see Jevan reduced to a gibbering wreck by the majesty of their dark master. It’s close (8 Insanity gained, for a total of 10 out of 12), but he’s picking himself up. He locks eyes with the acolyte and lightning lashes out. The Acolyte stumbles back smoking and shrieking “Get him!”, whilst one of the serpent people dies. The serpent people hiss and descend into the pit, whilst the acolyte steps up to the edge and casts Drain Life. Two of the serpent people manage to land a blow. The remaining serpent attacks, but misses, as does a followup strike. I forgot that Jevan should be frightened for 8 rounds due to the Sanity damage, which would prevent him from taking fast turns, and require all attacks to have one Bane. It wouldn’t have changed the result of the last two rounds though. Jevan concentrates, and his short sword appears in his hand. The serpent lunges again, both striking with the spear and sinking its fangs into Jevan’s shoulder. (1 damage from the spear, and 1 from the poison. Fortunately he makes the Str roll to avoid extra poison and sanity damage). 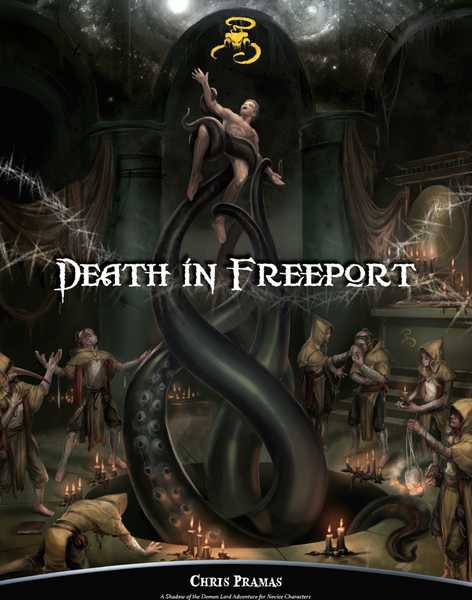 Sword in hand, Jevan stabs forwards and skewers the serpent person through the throat. Well, that escalated fast. Probably should have just taking the Sanity or Corruption for Defying danger, but where it really went wrong was the acolyte not believing the “I want to join you” line. Failing the roll to avoid being thrown in the pit was just the cherry on the cake. The serpent people are supposed to ambush the characters through one of the secret doors at an inconvenient time, so at least that’s not going to happen. Also there’s one fewer acolyte in the final encounter. The Drain Life spell is pretty nasty, but they only have one cast of it; the real danger comes from their Level 0 spell, that if it rolls more damage than the target has health, the target just drops dead. For a spell like that we’d roll the damage straight for the comparison. The module allows for the characters accidentally triggering the pit of tentacles by playing with the ritual implements; whilst it’s the cult initiation ritual, it doesn’t require any cult knowledge to set off.